4X Magnifier by UltraDome 2.5 inch - Self Focus/Light Gathering Magnifier. This solid acrylic dome magnifier offers optical clarity by gathering light. It glides effortlessly across any surface for ease of use. View magnified objects from any distance, in perfect focus! UltraDome can be used in viewing maps, charts, fine print, stamps, coins, photographs, and even X-Rays. Free polishing cloth included. Power: 4X Width: 2.5 inches. 4X Magnifier by UltraDome 3 inch - Self Focus/Light Gathering Magnifier. This solid acrylic dome magnifier offers optical clarity by gathering light. It glides effortlessly across any surface for ease of use. View magnified objects from any distance, in perfect focus! UltraDome can be used in viewing maps, charts, fine print, stamps, coins, photographs, and even X-Rays. Free polishing cloth included. Power: 4X Width: 3 inches. Full sheet magnifier. Great for viewing maps, charts, phone books, newspapers and magazines or any document with a small font. 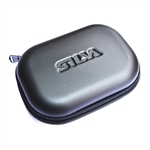 SILVA Compass Case Hard Shell. 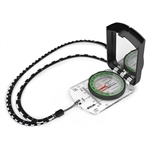 Hard compass and battery case provides the perfect way to safely protect and carry your compass or spare batteries. Suitable for all size compasses including the Silva Field and Ranger compasses as well as all battery sizes. Has a sturdy zipper closure and two mesh internal pockets. The ever so popular SILVA Ranger series has gone through a face-lift with updated colors and updated graphics. A completely new feature is the distance lanyard; a lanyard with scales (1:25k and 1:50k) which facilitates to measure the distance of your hike. SILVA Ranger features DryFlex™ grip for easy handling and comes with a use-anywhere declination scale inside the capsule, a magnifying lens, and base plate map-measuring in mm and scales of 1:50,000 and 1:25,000. A go-anywhere tool for serious compass users. The lanyard is soft and bendable and easy to place directly on to your route on the map. The new graphics contain a more distinct arrow (Ranger) and a more contemporary font. The colors change to green and black to harmonize with the other outdoor assortment. If you are looking for a basic but functional compass for your outdoor adventure, Ranger should be your choice. Thanks to the magnifier you can make sure to see every detail on the map. Our Ranger S mirror sighting compass should be your choice when you must determine direction over long distances. Because you needn’t lift your eyes from the compass to look into the terrain, the direction determined with the SILVA 1-2-3 System® becomes more accurate. Comes with a 5 year warranty. The most popular base plate series among mountaineers, backpackers, and hunters. The ever so popular SILVA Ranger series has gone through a face-lift with updated colors and updated graphics. A completely new feature is the distance lanyard; a lanyard with scales (1:25, and 1:50) which facilitates to measure the distance of your hike. Silva Ranger S features DryFlex™ grip for easy handling and comes with a use anywhere declination scale inside the capsule. A base plate map measuring in mm and scales of 1:50,000 and 1:25,000. Ranger S has the additional benefit of 45 degree angle assistance on the mirror sighting function. A go anywhere tool for serious compass users. The lanyard is soft and bendable and easy to place directly on to your route on the map. The new graphics contain a more distinct arrow (Ranger) and a more contemporary font. The colors change to green and black to harmonize with the other outdoor assortment. If you are looking for a basic but functional compass for your outdoor adventure, Ranger should be your choice. Thanks to the magnifier you can make sure to see every detail on the map. Our Ranger S mirror sighting compass should be your choice when you must determine direction over long distances. Because you needn’t lift your eyes from the compass to look at the terrain, the direction determined with the SILVA 1~2~ 3 System® becomes more accurate. The SILVA Starter Compass 1-2-3 is a perfect entry level compass appreciated by scouts, schools and leisure navigators around the world. The Silva Starter Model 1-2-3 compass is a great tool to get started working with maps and orienteering, the perfect compass for beginners. With a 2" x 3" base plate and a turn-able housing, it’s pocket size and great for map work.